One of the joys of writing about wine is, indeed, the packages that arrive requiring a signature. Some are expected, others are not. Each time, it is a little like Christmas. You may have a good idea of what is inside, but there is always a little flutter of expectation with the slicing of the tape. Sometimes the surprise comes, not with viewing the bottle, but what happens when you open it. I recently received three wines from Banfi: a Rosso di Montalcino (always a bit of comfort), a Prosecco (always a bit of fun), and something unexpected. 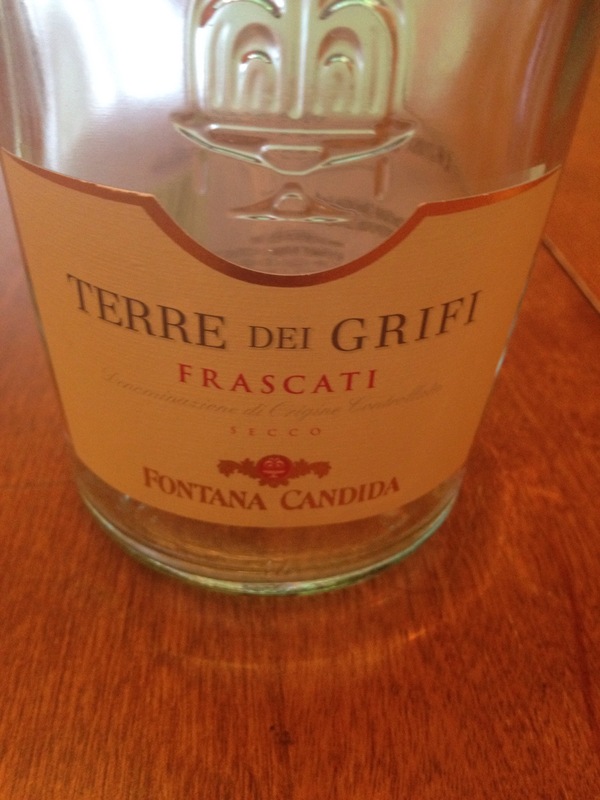 I read the description of 2013 Fontana Candida Terre dei Grifi Frascati DOC and thought, hmmm. Composed of 50% Malvasia Bianca di Candia, I thought it may be a little a little sweet for me. I read on.. 30% Trebbiano Toscano, 10% Greco, 10% Malvasia del Lazio. I love Trebbiano, great acidity and citrus usually. I wasn’t sure what to expect. It was recommended with Thai or Asian (read sweet) but described as dry. Now I was really confused. And that, my friends, is why I always try to taste with an open mind. I brought it to my parent’s as an appertif (as recommended) for my father’s birthday. That way, if it were indeed too sweet, I had just the people there to enjoy it. It turns out, that was everyone. Light and tropical, fruit forward without too much residual sugar. It was bright but not biting, refreshing and easy to drink. And at around $13 it is great for summer parties with a little something for everyone. Surprise! The Rosso and the Prosecco were as expected. The Maschio Brut Treviso is festive, citrus and stone. 100% Glera it is classic Prosecco in style and composition and another great Monday wine ($13). The Rosso is fruit, and spice, and everything nice. Just enough tannins to give it structure while remaining versatile. I never say no to either. Let’s face it, I don’t say no to wine very often. I always like to try something new. Sometimes it is hard to check my expectations at the door. But, now I know, even more definitively, that surprises come in all sorts of packages and packaging. Yay! I love wine surprises too. The type that show up at the door and the type that show up unexpectedly on my palate!